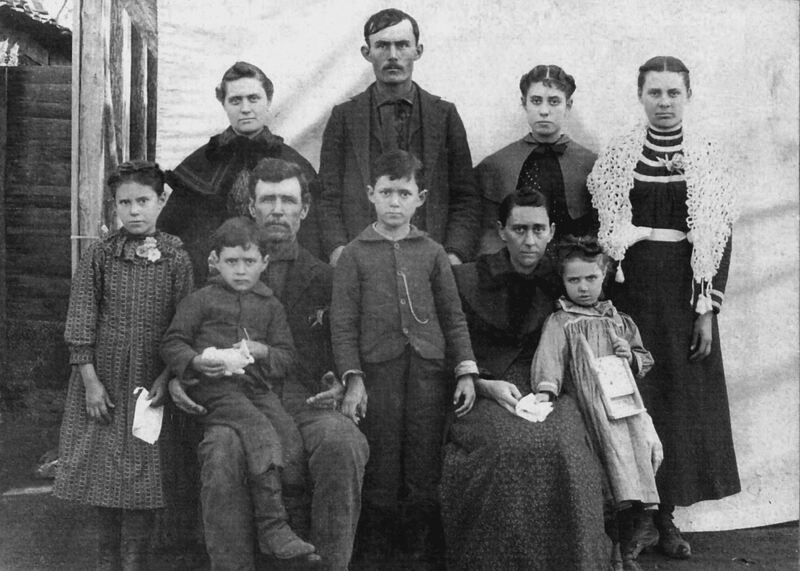 Photograph of Elijah Emanuel Stevens Family.click on photo for larger view. .
Elijah Emanuel Stevens, born Aug 10, 1846 in Union Co, NC; died Mar 7, 1921 in Shamrock, OK. He was the son of Christopher Stevens and Catherine Phifer who moved to Madison Co, TN between 1850 and 1860. Elijah married Nancy Adeline Gurley in 1873 in Madison Co, TN. She was born Jul 20, 1856 in Henderson Co, TN, and died Feb 17, 1950 in Cloverdale, Sonoma Co, CA. Little girl leaning on Nancy is the daughter of Ida Bell (Stevens) Blackwelder: Clauice Ina Blackwelder: b. 27 Oct., 1895; d. 23 Nov., 1958.